Hi, my name is Kristen and I'm addicted to Instagram. Its true...I literally check my Instagram account when I first wake up in the morning, several times throughout the day and it's the last thing I look at before I go to bed (sorry Steve). 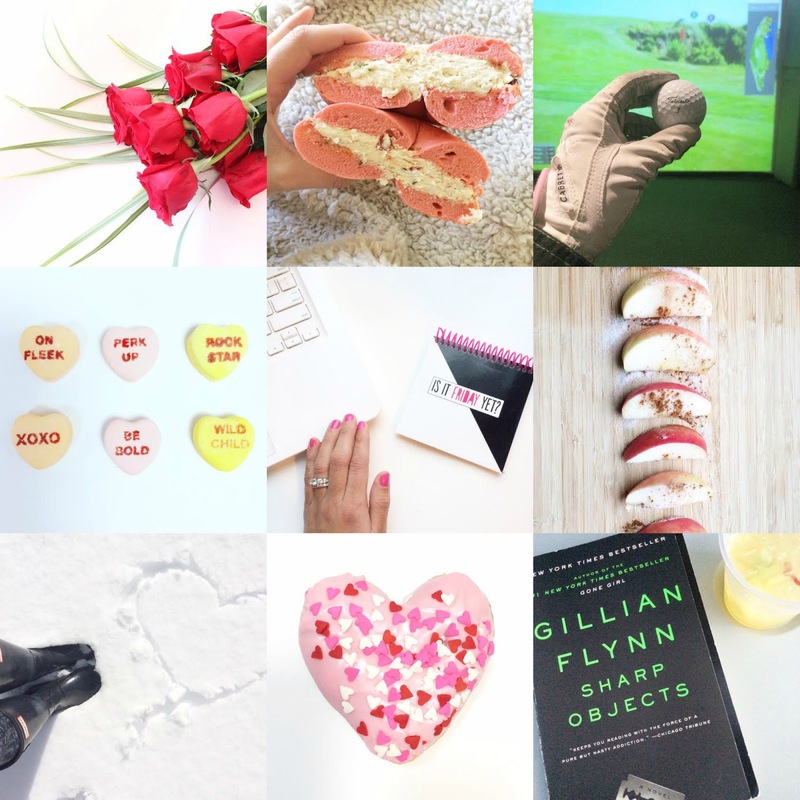 Today, I will be sharing my first Instagram roundup and will hopefully be doing one every month following! 1. I figured no one shared their Valentine's Day roses on Insta, so I figured I would be unique and share mine... Valentine's Day was really special to us this year, because it was our 6 month anniversary as a married couple! 2. On Valentine's Day we went to my favorite Bagel shop and I was SO excited to see that they had dyed their bagels pink and shaped them into hearts for the Holiday! My husband was laughing at me when I was ordering, because I was just too excited for words (the little things in life people). 3. Saturday night, Steve and I went and played a virtual round of golf with my parents. I sucked even worse than I do in real life...I can't even believe that's possible! 4. I picked up some sour Sweethearts for Valentine's Day and then strategically laid them out on a white background for your Insta-viewing pleasure! 6. Snow day snack- Apples sprinkled with cinnamon & sugar for the win! I confess that I was starving when I took this picture, but still managed to strategically place them on my wooden cutting board to get a good shot for the Insta! 7. The snow in Boston this year has actually been enjoyable (did I really just say that)? Seriously though, last year was absolute mayhem with the snow in Boston and am so glad that this winter has been a lot milder. Let's hope it stays this way! 8. Friday's are for eating doughnuts! I saw this cute lil' heart doughnut at Dunkin' Donuts and knew I had to take a picture for Instagram try it. 9. Did you catch my Book Review on Gillian Flynn's Sharp Objects!? If not, you can check it out HERE. Be sure to follow me on Instagram for fun pictures like the above!